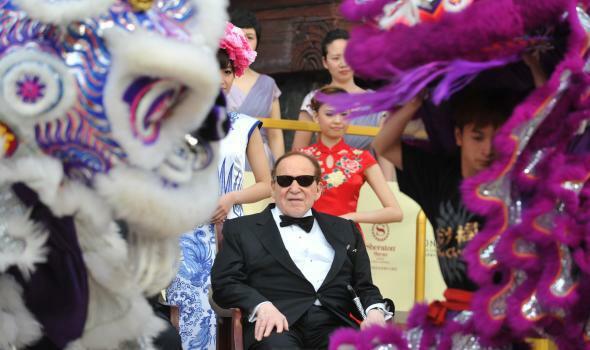 Sheldon Adelson 2016: Casino mogul is expected to spend big in GOP primary—but will he bet on a winner? Sheldon Adelson Bet Big in 2012 and Lost. Has He Learned From His Mistakes? Chairman and CEO of Las Vegas Sands Corporation Sheldon Adelson watches a lion dance at the opening ceremony of the Sands Cotai Central, Sands’ newest integrated resort in Macau on April 11, 2012. The Koch brothers are set to play a historic role in 2016, but they’re not the only conservative megadonors who could shape the election. This weekend, casino mogul Sheldon Adelson will host a pair of GOP contenders and a slew of other Republican politicians at one of his Las Vegas hotels. There, Texas Sen. Ted Cruz and former Texas Gov. Rick Perry will be addressing the Republican Jewish Coalition—but in reality their eyes will be on Adelson, who spent a staggering $100 million in 2012, making him the largest individual donor (non-dark money category) that election cycle . Adelson’s attraction to Rubio is in no small part centered on the Florida senator’s outspoken support for Israel, an issue near and dear to the billionaire’s heart. Rubio has reached out to Adelson more often than any other 2016 candidate, sources close to Adelson say, and has provided him with the most detailed plan for how he’d manage America’s foreign policy. Rubio’s campaign strategy is built around the idea that he can keep hanging around until current establishment favorites like former Florida Gov. Jeb Bush and Wisconsin Gov. Scott Walker begin to stumble, and Adelson’s cash would in theory allow him to do just that. Still, a lot can happen in the nine months between now and the Iowa caucus. Almost as important as how Adelson spends his millions will be when he spends it. His top advisor told Bloomberg in February any decision wouldn’t come until “well into 2016.” Politico’s sources are suggesting the timeline may be a little shorter than that, but that nonetheless Adelson will wait at least until after the second GOP primary debate, which is currently slated for September. By keeping the candidates in suspense, Adelson can use his cash much like Charles and David Koch are using theirs—by leveraging the promise of it to bend the GOP field to his policy preferences. And when it comes to policy that appeals to Adelson, Rubio’s has plenty of competition. Forbes pegs Adelson’s net worth at $32 billion, making him the world’s 12th richest person in the magazine’s rankings. Given his fortune, he would stand to benefit greatly from any number of the tax-cutting proposals being floated by GOP hopefuls, including those from Cruz and Perry, who he’ll hear from this weekend. He’s also clashed with unions in Nevada, making Walker a uniquely appealing candidate. And Adelson’s disdain for Internet gambling that cuts into his casino’s profits is also well known—so don’t be surprised to see more Republicans come around to that view, one that he already shares with Sen. Lindsey Graham. Still, the way to Adelson’s heart—and his wallet—is widely considered to be by way of Israel. Given the general hawkishness of the entire GOP field, then, he could simply wait to splash the primary pot until after the winnowing, to ensure that he’s placing his bet on a candidate who would still be in the game without his backing. Whether Adelson is willing to wait that long will tell us a good deal about if he learned from his 2012 mistakes, of if he’s doomed to repeat them. Read more of Slate’s coverage of the 2016 campaign.